This is a "Live Steam" scale (1:8; 7-1/2") ridable model train. 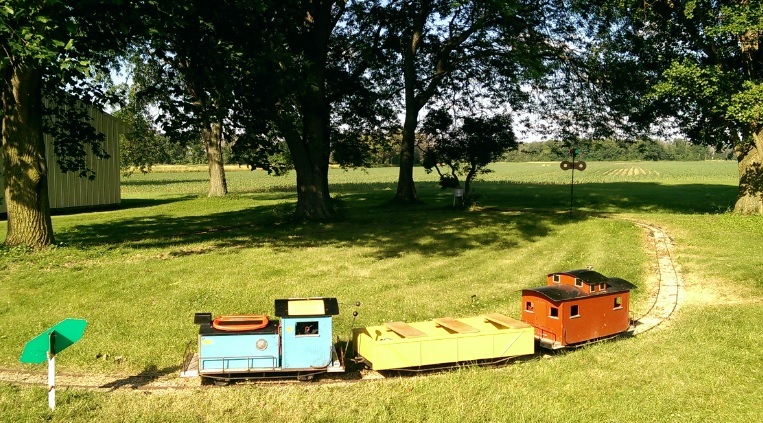 The train was built for kids to have fun. However, misuse or lack of attention could possibly result in injury. 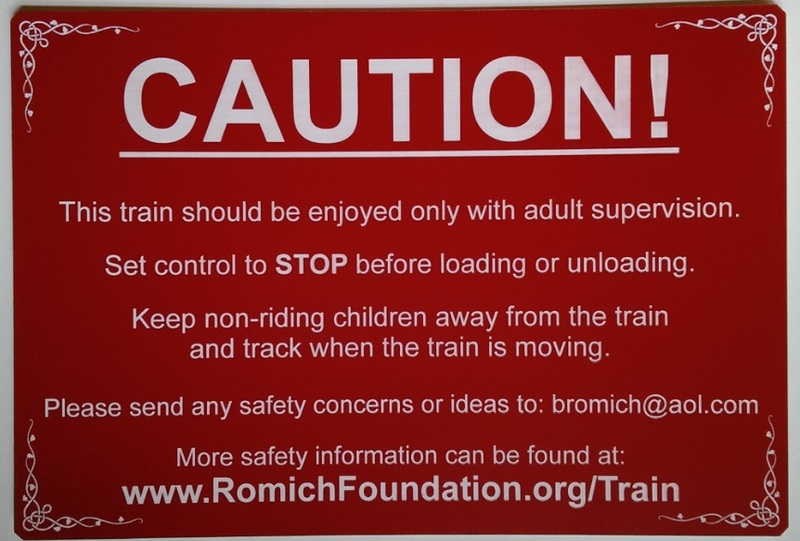 when a Romich family member is present and be careful. The original train was built mostly of junk and stuff that was lying around. The known exceptions are the wheels and the track. The wheels were cast and the track was fabricated from new (Yes, shocking!) steel that Ben welded together. He built a form for holding the steel in place for welding the curves. The original power source was a one cylinder 4-cycle gasoline engine. This engine was apparently unsuitable for other farm uses where ease of starting and reliable operation were important factors. The struggles with the engine were a source of amusement for all but those waiting for their rides and those actually working to get it going, which encompassed nearly everyone in the vicinity. A clear rain cover protects the train and yet allows it to be enjoyed when not in use. CAUTION! If the train has been covered and in the sun, it can be HOT! 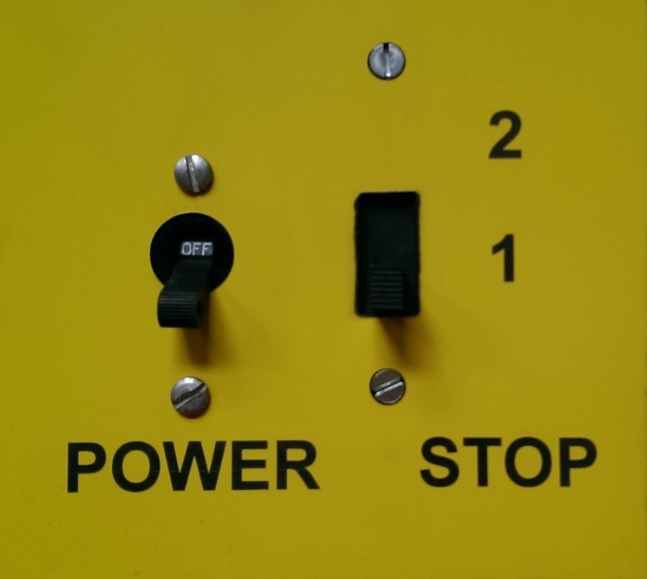 Before loading, make sure the control panel circuit breaker is OFF and the speed slide switch is down, in the STOP position. Also, the transmission lever should be in the NEUTRAL position. After loading passengers, turn on the POWER circuit breaker and move the slide switch first to the 1 and then to the 2 position. The motor should be running now. Pushing the transmission lever to the FORWARD position should start the train moving. Moving the train in the reverse direction may derail cars on the curves. If mosquitoes are a problem, repellant is kept in the gondola car. 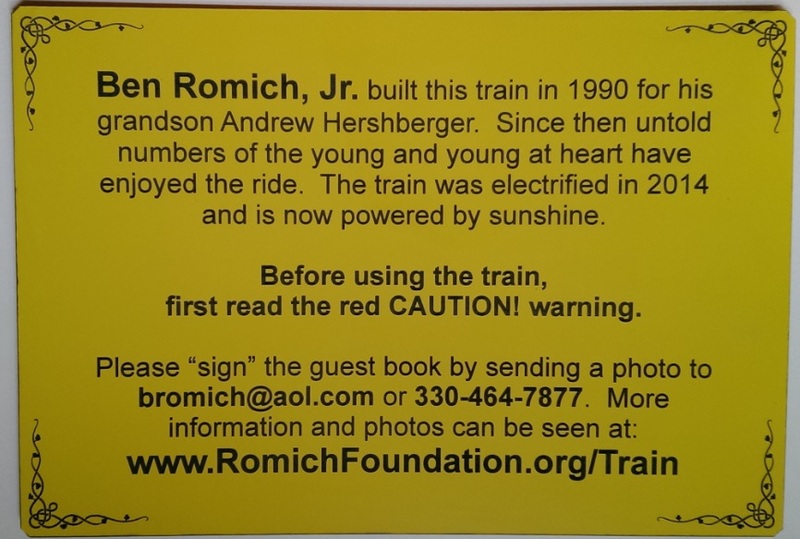 Please "sign" the guest book by texting or emailing a photo(s) with date and names to 330-464-7877 or bromich@aol.com.